As part of our mission to "share Christ with those who have not yet accepted Him as Savior and Lord," church members are encouraged to participate in a number of local outreach efforts. Some opportunities are focused on reaching our own community and others take us into other areas of the Northwest to minister to a variety of needs. 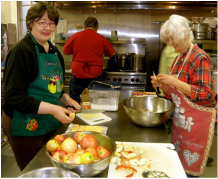 For more information about any of the following mission efforts, including how to volunteer, email andrea@grantavebc.org or contact the ministry leader listed below..
Stone Soup is an outreach to the homeless population of our city where volunteers from our church help prepare and serve dinner once a month. The meals are served at the First Christian Church. Two shifts are available: 1) 3:30 pm (food prep) and 2) 5:30 pm (food service). If you're interested in helping, contact Sharon Forrer at 541-752-4444. Our church is one of nearly 50 partner churches that support Love INC (In the Name of Christ) both financially and with volunteers. The mission of Love INC of Benton County is to mobilize the church to transform lives and communities in the name of Christ. It does this with the help of about 1,500 volunteers from its partner churches, who serve in more than a dozen "Gap Ministries" to help meet both the physical and spiritual needs of people. To learn more about how you can volunteer with Love INC, click on the link above, or contact our Love INC Church Ministry Liaison Dixie Green at 541-752-7950 or dleegreen@aol.com. We often receive requests for emergency food boxes from people who run out of resources to provide for their family. Volunteers are always needed to help keep the church food closet well-stocked and organized and to put food boxes/baskets together and deliver them to people in need. 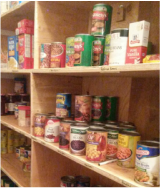 This ministry also provides special food boxes to families at Thanksgiving and Christmas.